It seems appropriate that Dennis Roberson’s office at IIT’s Main Campus is high up, 10 floors atop street level and competing with the upper-tier seats at U.S. Cellular Field, which commands the view from the office’s west windows. While being eye-level with Canada geese flying in formation can be a memorable experience, the real action takes place 12 floors above—on the roof of IIT Tower—where the world’s first and only continuously running terrestrial spectrum observatory is installed, and co-directed by Roberson. The observatory is actually an assemblage of antennae, each having its own frequency range, that detect electromagnetic radiation in the form of radio waves emitted from earth-bound devices such as cell phones, television transmitters, microwave ovens, GPS, Wi-Fi, Bluetooth, AM/FM/satellite radio, police and fire radios, and garage door openers. A main group captures signals from Chicago’s Loop and some as far away as Milwaukee; a second group can be directed toward any point on the compass and reaches the city’s collar suburbs and across the lake into Michigan. The waves are transformed into visible data via a spectrum analyzer and have yielded valuable information about usage that Roberson and his team are studying to determine how to make the most of the radio spectrum, that part of the electromagnetic spectrum that corresponds to radio frequencies. “What should impress you most about this chart is that the entire spectrum is allocated,” says Roberson, unrolling a large, laminated United States Frequency Allocations graph of the radio spectrum with blocks of color corresponding to areas of the chart assigned for services ranging from land mobile to broadcasting to radio astronomy. The Federal Communications Commission and the National Telecommunications and Information Administration share allocation responsibilities; the FCC administers the spectrum for non-federal use and the NTIA determines use by the armed services and other federal agencies. The FCC and other regulatory bodies have become increasingly aware that the radio spectrum is inefficiently utilized, a fact that has been substantiated by the IIT team after more than two years of collecting data. This fact has also caught the attention of Congress, where both the House and the Senate are working on bipartisan bills to require a regular spectrum-usage census for U.S. radio frequency usage. 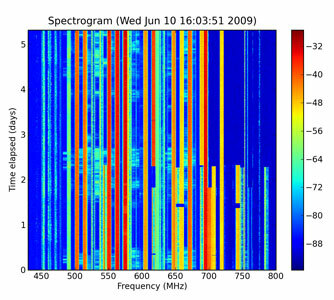 While the radio spectrum extends from 3kHz–300GHz on the electromagnetic spectrum, Roberson notes that most of the signals coming into the terrestrial observatory are in the 30MHz–6GHz range and are populated by devices commonly used at work, at home, and by various commercial and public-safety organizations. In fact, in the Chicago area overall, most of the spectrum is not very heavily used, especially in the higher-frequency ranges, thereby making that chunk a prime site for new applications that require spectrum. The team is also able to see usage by time. Between midnight and 4 a.m., for example, cell phone base stations are powered down, as usage is at a minimum. Over the Christmas weekend, there was a very low level of radio usage by public safety organizations, Roberson says. Roberson—who also serves as IIT’s vice provost for new initiatives and as a research professor in computer science—along with observatory co-directors Cynthia Hood, associate chair and associate professor of computer science, and Kenneth Zdunek (Ph.D. EE ’91), senior research scholar in the Department of Electrical and Computer Engineering, were inspired in part to initiate the observatory, a National Science Foundation-funded project, because of an emerging technology known as cognitive radio. A “smart” form of wireless communication, the radio can sense its environment and utilize that part of the spectrum that though allocated, is not in use. “It says that, in effect, I can now legally live in your home [spectrum band] with the only restriction being that I can never be there when you are and regardless of what I do with your home while I’m there, I have to return it to exactly how it was when you left it,” explains Roberson, adding that the topic of ever-increasing new demands on spectrum space that was allocated years ago for older applications is huge, ongoing, and profitable. Roberson recalls that in 2008, the FCC obtained nearly $20 billion in bids on a 700MHz block it had freed up.